If an offer is accepted by the seller it’s a legally binding contract for the seller, the buyer can still pull out at several check-points but the seller cannot continue to market the property. This acts to prevent gazumping. The buyer employs a professional to conduct an inspection. Professional? This person is not a qualified surveyor, no qualifications required. The fellow who conducted my inspection was like a caring dad who checked every window, every piece of equipment. He lit the oven, made ice, turned on the washing machine, checked all the lights and electric circuits, the boiler etc He gave me advice on how to look after the property and questions I should ask the Home Owners Association (HOA). He recommended that I attend a HOA meeting. He made observations about the other tenants. He was awesome. A buyer can pull out of the agreement after an inspection. Immediately prior to the money exchanging there is a ‘walk through’ of the property in the estate that it will be handed over. The money is not exchanged if the purchaser is unhappy with the walk through. My ‘Inspector’ explained that a resident may have a big leaving party that leaves broken windows and toilets etc. The final walk through makes sure that they pay for any damage between agreement and departure. Nice. How does the intercom work – there’s no in apartment equipment – is there a cell phone app for that? Are those sockets for internet connections or phones? Can I put more powerful bulbs in that light fitting? It feels good to shift to asking trivial functional questions, clearly the big stuff is working well. The apartment is 4 miles from work and has ample bike storage in the basement. I could get fit in the summer. The route to work is through prettily housed suburbs. As the inspector checked the apartment I pondered the view, watching the tail’ lights of city traffic. I felt at home. It felt right despite being so very different from my little hidden garden cottage in Reading. We all change as does the world around us. Time for a high rise garment with scary balcony…..
I’ve successfully sold the Wendy house in Reading Town. There were bumps in the process. The four month process from putting the place on the market (July 22d) through to completing on the sale (Nov 28th) was efficient by UK standards. The buyers were first time purchasers in the UK. A French couple. Their lack of familiarity with the local process meant that it took longer than the 3 months it took me to originally buy the place. I left them champagne, a gifted plant, a folder of historical documents and a book describing the history of the area. The garden looked a bedraggled, neglected mess and removing my furniture revealed some dampness that neither I nor they expected. I’ve been researching the building developer and condominium management company. This apartment block was built in 2008 and is managed by a huge company that manages condominiums all over North America. 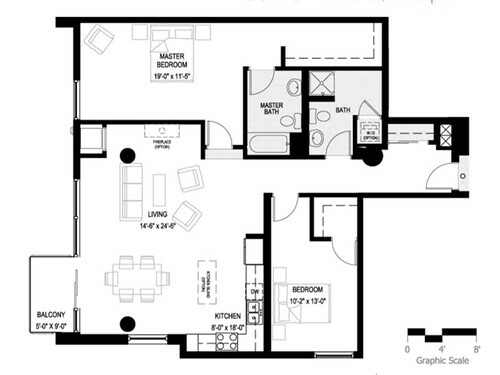 The developer is prolific and their conversions, including this one, have won design awards. I’m comfortable with the developer. Yelp reviews of the condominium management company are not good, they mention things like phone calls being ignored, maintenance work being difficult to schedule and generally tardy. Apparently getting the cash is the one thing they’re reportedly good at. I’m hoping that the reports are disproportionate and that when the company works well, no one bothers to review it on yelp.